We are packing up here in Florida, gearing up for our road trip north in a couple days. I wanted to share my favorite spot in the area to grab breakfast or lunch. It's a small family-run place that sits just two blocks from the beach and offers up the best organic food around. 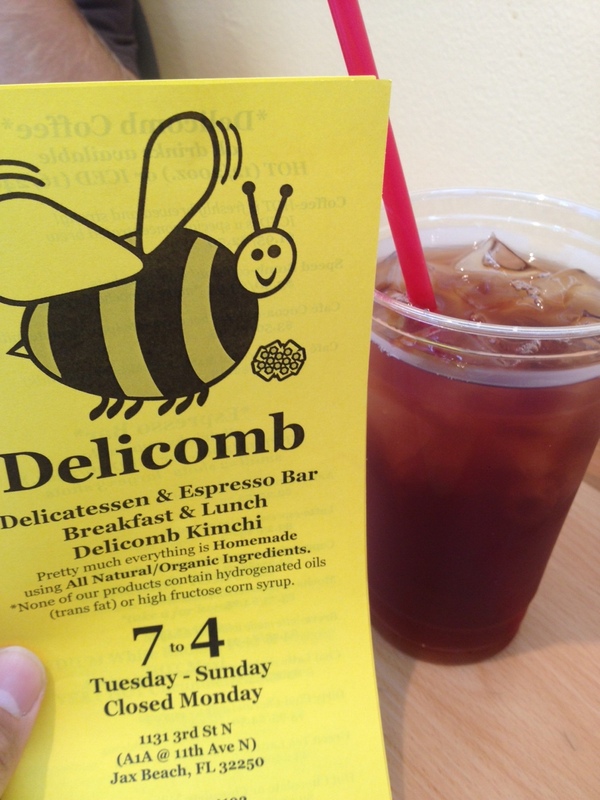 Delicomb is nothing fancy- serving breakfast all day, paninis and wraps, fresh salads and homemade kimchis- but the quality of the food is impossible to beat around here. I usually get the Naomi wrap (gilled tempeh, white radish kimchi, cheddar, avocado, carrot, cuke, honey dijon mayo, whole wheat wrap) and Greg usually gets the Greek wrap (boneless broiled chicken, feta, olives, tomato, romaine, itaian dressing, whole wheat wrap).